It's great discovering new entries to Podcastland, particularly those that push the boundaries of what we get to hear. 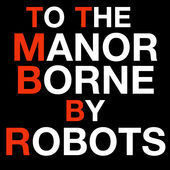 While To The Manor Borne By Robots is largely comedy-flavored, it is also by turns social commentary, science fiction, mystery, intrigue, with a helping of noir narrative ladled over the top. The overarching story involves a horrible monster, The Beast, who comes to Earth in the 25th century, bent on humankind's destruction. It turns out this creature can be lulled to sleep by telling it stories and therein lies the hook: Each episode features a stand-alone story that's ostensibly being read to The Beast, but these stories also fill in the blanks between our present time and the age where Earth gets ravaged. Episode 3's story, for example, deals with near-future technology that can take over and "drive" people like you would pilot a drone. Laced around these elements is a half-human cyborg from the future that has switched places with his 21st century ancestor in an attempt to discover the origins of The Beast and stop it before it can wreak havoc. This is one of the most layered 50 minutes of podcasting I've ever heard. Employing decent writing and great voice acting, the show is the brainchild of John Eder from Los Angeles and I find it very compelling.